She is best known as the go-to style guru from TLC’s “What Not To Wear” which aired from 2003 to 2013, cementing herself as a modern American fashion icon at the intersection of style and television. 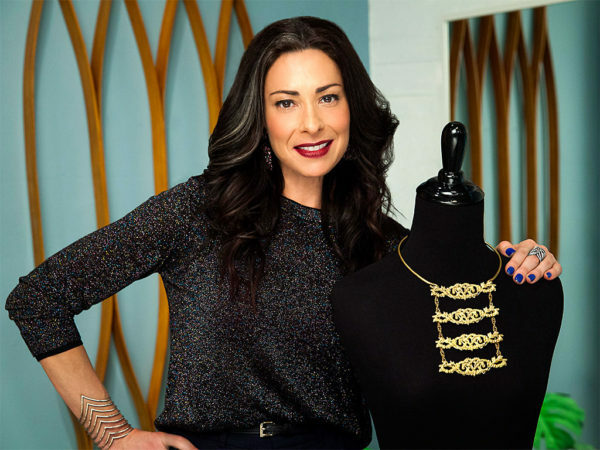 Stacy London is not just a stylist, she is an author, a magazine editor, a multiple-brand ambassador, and creative director for Westfield Style. But forget about all the media-driven headlines and narratives about her, because the way she describes herself and her perspective on fashion has made us love this badass a whole lot more. September is the biggest month of the year on the fashion calendar. It is the time when all the major trends are predicted, coming straight off the 4 main fashion week runways, and when style publications and websites go into hyper-drive telling people what to wear and what not to wear. This year, Stacy is foregoing all of that and brilliantly explained why in this epic op-ed for Refinery29. Titled “How I Moved On From My ‘What Not To Wear’ Style”, she outlines how, at age 47, she is expected to be a certain type of woman, but she is saying “f*** it!”. The mantra of “acting your age” is something she is no longer willing to adhere to. “At my age, if you aren’t Oprah or a man, the stigma of getting older starts to take shape…I’ve grown up without becoming a conventional grown-up. Meaning, I’m not married. I don’t have kids, a second home, or a mortgage. I don’t run an office full of employees. I don’t go to the same job every day. And because of this, sometimes people (myself included) find it hard to measure my value without the traditional milestones of a life lived or a collection of identifiable CliffsNotes at the ready,” she begins. She says it feels freeing not to bow to the societal pressures placed on women as they get older, and this is the kind of narrative we need to hear more of, in droves. Celebrities like Renee Zellweger and Jennifer Aniston have also recently penned op-eds of their own dismantling the notion that they need to look a certain way (Renee) or have children and be married to feel complete (Jennifer). Perhaps if Hollywood didn’t dictate that women are only desirable when they are young, there wouldn’t be so much discussion about 50’s star Kim Novak’s appearance at the Oscars a few years ago. Stacy revels in the knowledge that she can’t be defined by the existing status quo. “Not being able to be labeled so easily has its advantages. I’m a curiosity of sorts. I’m a mystery. An enigma. People seemingly want to know more about me, because I haven’t played by conventional social rules. I don’t ‘act’ my age,” she writes. But of course as she has gotten older, and not had any children or chosen to marry, Stacy explains why this is becoming more of a common theme amongst other women. “I am part of the first generation of women not truly dependent on anyone. My feminist mom was married, had kids, got divorced, and made a career for herself. Does only being able to check the last box make me a pariah or a pioneer? Because in my opinion, they dress differently, I can tell you that,” she said. While she says she may still have kids and marry, she will not look at it as something she must do or feel dissatisfied with her life. For now, her career is her “baby”, and she is proud of what she has accomplished, as she should be! And it is quite ironic that she says she started to feel pressure about her age mostly from the very industry she works in – fashion. “I didn’t really start to think about my age until I started to feel that all clothes were not appropriate for me. Now, of course, not all clothes and not all trends are appropriate for everyone. I spent years and years telling everybody yes to this, no to that. But when I started to ask myself if a dress was too short or showed too much skin or the eyeshadow I wanted was a little too bright, I realized my style wasn’t in Kansas anymore,” she recalls. 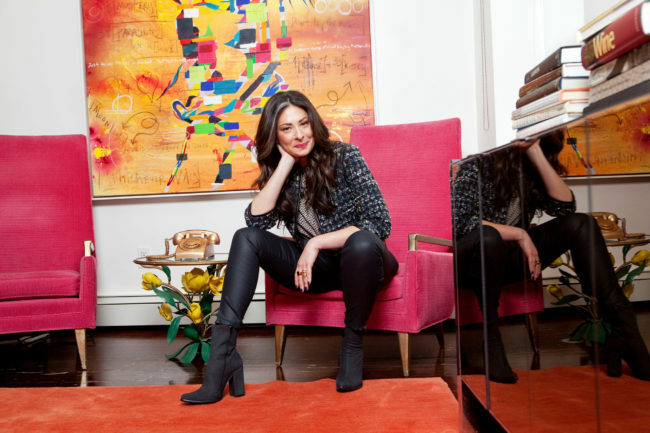 The TV version of Stacy London we were so used to seeing for many years no longer reflects the person she is today or the style she loves the most. “When I look back, I realize the style I had while I was on ‘What Not to Wear’ — the pencil skirts and sheath dresses, the floral and ruffled tops — does not reflect who I am now. It reflects the television persona I gave up a long time ago. It no longer “fits.” (Pun intended.) 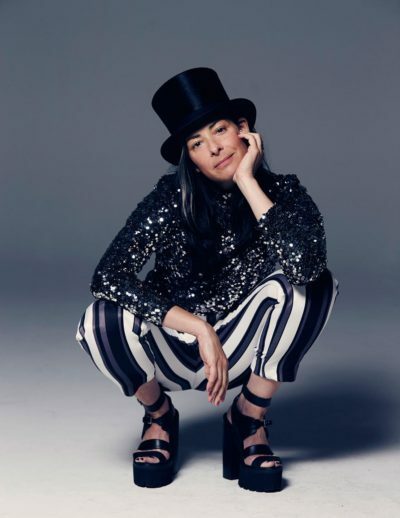 I dress much more androgynously than I did when I was younger…I like suits and leather and jumpsuits, and I almost exclusively wear pants,” she explains. While she is worried some of her fans may not like her current style, she says growing older has naturally changed who she is. At this point in her essay she draws from the wider cultural influences, explaining why she is forcefully disdaining from falling under their spell. “It isn’t simply that I no longer play by the gender rulebook, it’s that the rules suddenly feel stacked against me. We still live in a culture where men grow more handsome, distinguished, and even trustworthy with age. Women are not afforded the same. Sociobiologically speaking, in caveman days, if we could no longer bear children our use-value dropped sharply and inevitably…Current culture leads me to believe I’m supposed to attempt to look 25 for the next 50 years. Even if we’re past bearing children, are we meant to look as if we still can? Is that what Botox and fillers and peels and exercising 11 times a week are meant to do for us? Hang on. What?” she asks incredulously. There are many other cultures and societies which revere age, so why not ours, she asks? Of course it is important to be healthy and strong, but why is there such an emphasis on looking young? “Why don’t we embrace age for all of its positive attributes? Because to value those things above youth and a particular kind of beauty requires a change in thinking (and seeing) much like changing the way we perceive a woman like me,” she says before listing the benefits of being a woman in her 40’s. “You can ask me about politics, the stock market, the best movies of the 1970’s, what I think of this election, and of course whether or not you should keep the dress you wore once three years ago. (The answer to that is OF COURSE NOT.) I don’t want to be defined by my age. But I consider it to be a great asset. You can ask me about heartbreak and disappointment, about triumph and fear and courage. I’ve had more experience with it because I’ve had more TIME to have experience. And I want my style to reflect that experience,” she said. She considers herself part of a generation of female leaders who are redefining what a successful woman looks like. 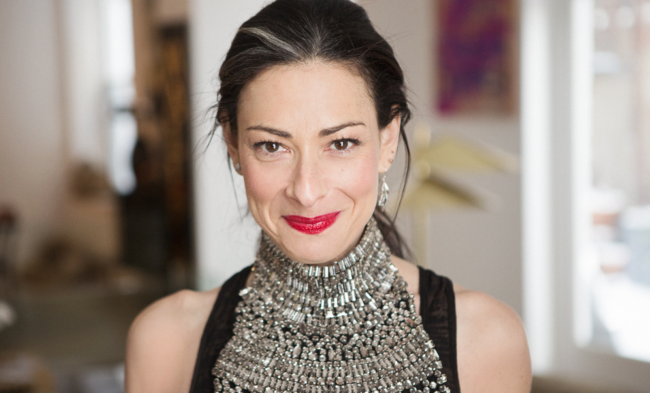 Women like Stacy London are proven examples that we live in a world today where women can (for the most part, depending on which country you live in) choose their partners, how many children they want to have, what career they want, and not have to rely on anyone else to be financially, emotionally or physically supported. Compared to our grandmothers and great-grandmothers, many of us are choosing relationships for entirely different reasons than they did. We don’t have the same need for a marital social status the way women did 50+ years ago. And when it comes to her style, Stacy says choosing not to play by the unspoken “age rules” is her living out that evolution in mindset. “There’s never been a better time to be an ‘evolutionary woman.’ We are more accepting of self-expression than ever before. It’s not my gender I’m questioning…Rather, it’s the demands society tends to put on the way I (and perhaps even some of the women who appeared on What Not to Wear) look…I have no interest in emulating a purely masculine style to have a seat at the table,” she said. There was a brief moment in time, Stacy muses, where the fashion world started waking up to being a little more inclusive of women over a certain age, rather than discarding them. But sadly, it was more about a trend, than leading a movement. “No matter HOW you dress, many women my age don’t always own the exciting possibilities afforded them because they don’t feel valued by our current culture. In fashion advertising, the end of 2014 and most of 2015 all of a sudden became the Age of Age. 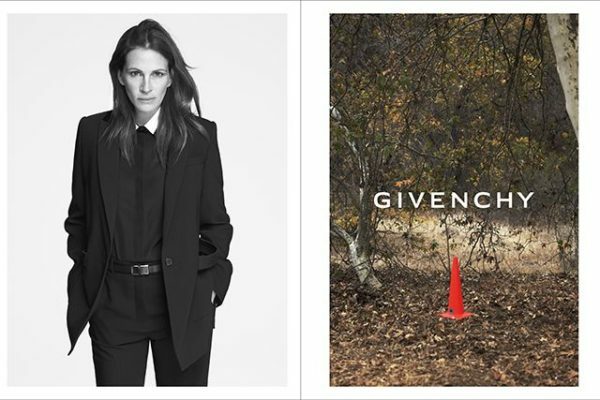 Julia Roberts for Givenchy. Cher for Marc Jacobs. 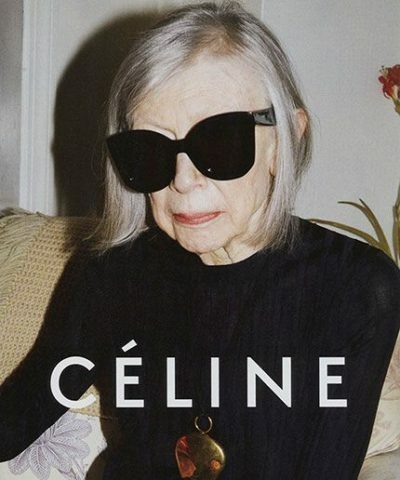 Joan Didion for Céline. Charlotte Rampling for Nars. Iris Apfel for Alexis Bittar. Seeing older women incorporated into the fashion world should feel like progress. But the Age of Age came and went in less than a year…To sensationalize age for the sake of attention isn’t the same as reverence or acceptance. It merely made age a momentary trend. Trends can be escaped. Age can’t,” she said. At the end of her essay, she reiterates that this is not her sticking her proverbial middle finger in the air simply because she wants to wear a certain type of clothing the world has decided it no longer “acceptable” for her age. No, it is about her sticking her proverbial middle finger in the air to the deep-rooted cultural standards which foster these types of mandates and mindsets. “It’s about taking a hard look at the traditional ideas that are associated with women’s inalienable rights, be they wearing skin-baring dresses or having children, and that “having it all” no longer means those rights need to be exercised. As our freedoms change, so too will cultural expectations,” she said. Amen to that! And may all who read this know that no matter what age you are, feeling like you finally DGAF about the standards is just the start of your best years!